BuzzDoes, a newly launched word-of-mouth marketing tool for mobile app developers, has secured $750,000 in seed funding from angel investors and Proxima Ventures. The tool, which operates as a drop-in SDK (software development kit), allows developers to add a viral recommendation feature to their application using a single line of code. Once installed, app users are “incentivized” (meaning rewarded), for recommending the app in question to their friends. Getting a mobile app noticed in the increasingly crowded mobile app market is more difficult than ever, with some 600,000 iOS applications filling up the iTunes App Store’s shelves, and around 400,000 apps on Android. Although many companies have been experimenting with different means to get their app noticed, word-of-mouth recommendations from trusted sources (e.g. friends, trusted sites, etc.) is one of the only consistently proven methods that can help boost an app’s ranking. Essentially, BuzzDoes is trying to kickstart the typically organic viral recommendation process where users tell friends about great apps they should try. To do so, app developers using BuzzDoes can choose to reward users who share an app with friends. The rewards come in the form of BuzzDoes points that users can redeem for cash (via PayPal), or users can donate the points to a charity instead. The secret sauce for this startup, however, is not just the sharing feature – it’s that BuzzDoes is also able to detect when a new user downloads and app because of the recommendation. At first glance, the idea for a “recommendations-for-rewards” type mechanism feels like it could get a little spammy, but the way it’s implemented sounds rather smart. 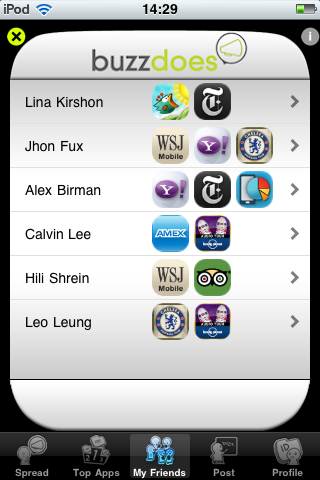 When a user enters the section of the app where they can make the recommendation, they’re also able to see which apps their friends are downloading, something that adds a social element to the app discovery process. If they’re interested in downloading one of the other apps here, they just tap the app in question and their friend gets the points. For developers, it’s a win because they get new users, but for the app customers involved, this sort of in-app discovery feature feels far less intrusive than mobile ads. In fact, it doesn’t really feel like an ad at all – it feels like a feature. Developers are offered the BuzzDoes SDK for free, and don’t have to pay unless they actually gain new users through the word-of-mouth recommendation network. That’s a different take than what traditional “incentivized” install companies (e.g. TapJoy, W3i, etc.) provide. In most cases, developers pay upfront for a set amount of downloads which are acquired through “marketing actions,” like offers or through downloading other 3rd-party mobile apps. According to BuzzDoes CEO Assaf Kolirin, the cost to acquire is as low as $0.20 per user, versus today’s averages of $1.50-$3.00 per user. BuzzDoes launched a month ago at the AppsWorld conference in London, and went live just two weeks ago. It now has over 100 developers on the platform – something that speaks to today’s enormous and still unsolved challenge of user acquisition and app discovery. The $750,000 in seed funding was raised from a few leading angels in Israel and South America, including Avraham Gilat, as well as Proxima Ventures.